Bentley CivilStorm предназначен для точного моделирования каждого аспекта системы ливневой канализации, включая осадки, поверхностный сток, перехват и отвод стока, безнапорный и напорный трубопровод, водоемы для аккумуляции стоков, водовыпуски, открытые каналы, водопропускные трубы и т.д. 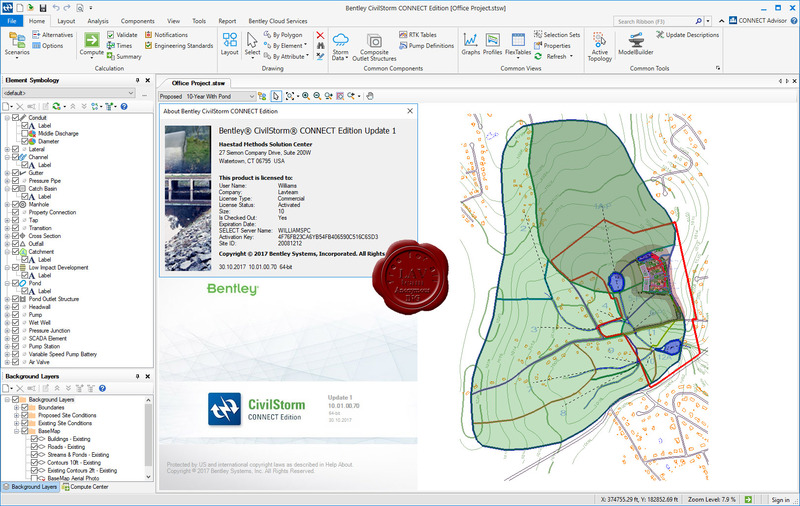 CivilStorm is a fully dynamic, multi-platform, hydraulic modeling solution developed for the analysis of complex stormwater systems. Engineers can analyze these systems using built-in hydraulic and hydrology tools and a variety of wet-weather calibration methods. From stormwater master plan development to water quality studies, CivilStorm provides an easy-to-use environment for engineers to analyze, design, and operate stormwater systems. Improved method for updating models using "snapshots”. Critical storm analysis showing which event is worst for any manhole or catch basin. Ability to track the source of storm event data. Support for Bing map background images. Checking models against engineering standards. Displaying TIN triangles in digital terrain models. Efficient method to bundle model files into a package to transmit and archive. Compatibility with UK Wallingford procedure.